Full function siren plus radio repeat and public address. Operates up to two 100 watt speakers. Includes Hands- Free operation and Scan-Lock siren tones. Self-contained unit for under-dash mounting. Hard-wired microphone. Two year warranty. Backward compatible to the original 295HF100 and WS2100 Series connector. Scan-Lock Siren Tones (Pat. # RE38,795) allow for user selectable siren tones via momentary recessed switch located on the rear of the unit. Choose the placement of each siren tone on rotary knob for complete user customization. Economical six function siren plus radio repeat and public address. Meets California & SAE specifications, SAE J1849 & California Title 13. Model 295SL100 operates up to two 100-watt speakers. "Hands-Free" operation. Turn On/Off and access all three siren tones (default Wail, Yelp and Piercer) without taking hands from steering wheel. Two manual functions allow for additional siren tone choices when you need it the most. PTT (push to talk) switch on microphone overrides all siren functions. Combination On/Off and horn ring transfer switch. Adjustable preset radio repeat volume. "Aux Enable" activates siren tones via input (slide switch, power controls or relay-to-ground connection). Quick disconnect plug for ease of service or replacement. Adjustable bail bracket allows the mounting of the siren in a variety of positions. Complements all Whelen's under dash products. Backward compatible to the original 295HF100 and WS2100 Series connector. Dimensions: 2-1/2" Height (63mm) x 6" Width (152mm) x 5-1/2" Depth (138mm). 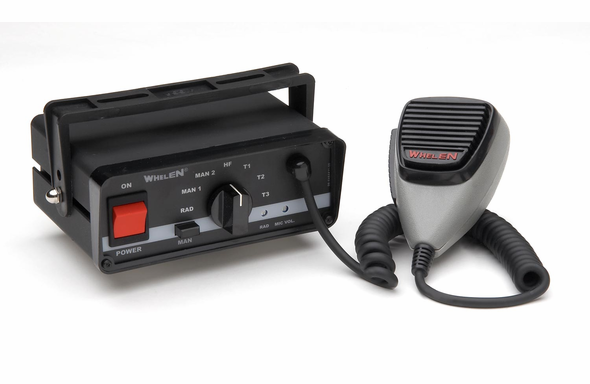 All Whelen Products are proudly made in the U.S.A. This Siren replaces 295HFSA1 siren.